These parcels of conservation land are rich in history and historical sites, including bridges, cellar holes, and stories of King Philip's War. 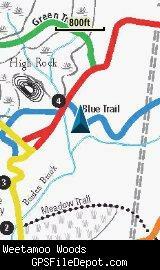 Over five miles of trails - some on colonial era roads - provide ample opportunity for exploring. Weetamoo Woods is owned by the town of Tiverton and the Pardon Gray Preserve is owned by the Tiverton Land Trust. See version history below for more information. Note that due to the wide coverage area of this map, it is actually 4 tiles. 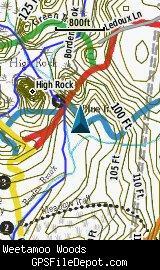 Keep that in mind when placing this on your Garmin GPS - even though this is one KMZ, the number of tiles is limited to 100 across all the KMZ files loaded on most Garmin GPS receivers (500 if you have a Garmin Montana). All of the images below are from a Garmin GPSMAP 78sc. The image on the left is with no other maps displayed. The image on the right is with the Garmin 24K NE series TOPO map displayed.